Vertican Technologies, Inc. of Montville, NJ (VTI) and Automated Collection Control, Inc. d/b/a YGC Solutions of Pine Brook, NJ (YGC) are both pleased to announce that their Boards of Directors have approved a definitive agreement for YGC to merge with Vertican, effective June 1, 2014. The agreement, endorsed by unanimous shareholder consent on both sides, is a friendly, stock-for-stock transaction in which Vertican has acquired 100 percent of YGC shares in exchange for shares of Vertican. The transaction will provide the collection industry with best-in-class technology that will help make their operations more efficient, compliant, and profitable. According to Isaac Goldman, Chief Operating Officer at Vertican Technologies, “This combination creates a company that will synergize the YouveGotClaims technology with the case management software from CLS and Q-Soft. The opportunity to bring all of these exceptional teams together will result in tighter cross-platform integration for all of our customers, while improving reliability and transparency throughout the entire collection industry.” Isaac has previously served as Chief Operating Officer at both CLS and YGC. Vertican will begin releasing new products immediately, beginning with Vertiply, its new comprehensive compliance tracking and reporting software. Full support and ongoing software enhancements will continue, uninterrupted, on all existing products from all four Vertican-owned companies, Q-Soft, CLS, YGC and Fillimerica. CLS and YGC hosted their 2013 Summer Picnic on July 9th at Yogi Berra Stadium, which is on the campus of Montclair State University in Upper Montclair, New Jersey. Yogi Berra stadium is home to the New Jersey Jackals, a minor league baseball team in the Can-Am (Canadian - American) league. 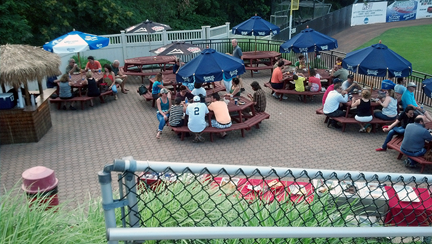 Not only was the joint-company picnic a huge success, the Jackals won Tuesday night’s game. Leading by one in the bottom half of the seventh, the New Jersey Jackals piled on four runs to pull away in an eventual 9-2 win against first-place Quebec. YCG and CLS friends and family enjoyed the camaraderie at one of two private picnic grounds at the stadium. Chicken, fries, hotdogs, burgers, wine, beer and soft drinks along with an entertaining baseball game made for a great time; especially since those “30% chance of thunderstorm” predictions never even threatened to appear. Several of the kids retrieved foul balls and some of them even got autographs too. Because this evening was so enjoyable, both companies plan on repeating the event in 2014; however, next year’s CLS / YGC picnic will be held on a Saturday to coincide with the fireworks that the New Jersey Jackals put on after every Saturday night home game.